Forty-one volunteers gathered along Onondaga Lake’s western shoreline Saturday, October 17, to plant trees and participate in citizen science monitoring by tracking bird species. The volunteers are part of the Onondaga Lake Conservation Corps, a group of community members who are helping to create or improve wildlife habitat in the Onondaga Lake watershed. Left: 9-year-old twins Autumn and Evelyn Keefe, of Syracuse, plant an eastern white pine, a native tree. 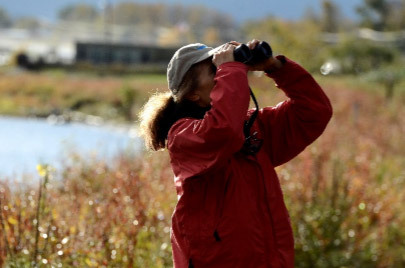 Conservation Corps members tracked bird species during a walk along the western shoreline. They identified 28 bird species, including bald eagle, ruby-crowned kinglet, eastern phoebe, and common merganser. More than 80 unique bird species have been identified in and around Onondaga Lake, including several rare species categorized as threatened or of special interest in New York State. Pied-billed grebe, northern harrier, and bald eagle are among the notable bird species that have returned. Left: Cheryl and Robert Belle, of Baldwinsville, New York, identify bird species with the help of Chris Lajewski, director of Montezuma Audubon Center. Right: Steve Mooney, Managing Scientist at O’Brien & Gere, helps 7-year-old Harris Buelow, of Manlius, New York, use binoculars to identify bird species. The Corps has helped transform Onondaga Lake’s western shoreline into new and improved habitat by installing native plants, and building bird boxes and habitat structures for wildlife. Left: Chase Salmons and Linda Salmons, of Camillus, New York, plant native species in August 2014. Corps volunteers also planted native wetland plants along the shoreline in July 2014, May 2015, and October 2015. Right: The western shoreline is now thriving. The Conservation Corps, awarded the 2015 United States Environmental Protection Agency’s Environmental Champion Award in April 2015, inspires future stewards of Onondaga Lake and its watershed through a hands-on, experience-based program that offers citizens and organizations the opportunity to participate in activities that help restore and sustain the Onondaga Lake watershed and its value as an Important Bird Area. 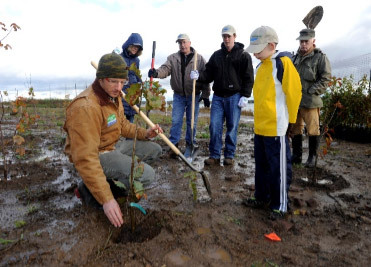 Since the formation of the Conservation Corps in summer 2012, 13 events have brought together more than 600 volunteers who have become environmental stewards and Corps members. Corps members have planted more than 4,500 native plants, trees, and shrubs, helping to create a home for more than 166 wildlife species that have been observed in and around 50 acres of restored wetlands. Corps partners include Audubon New York, O’Brien & Gere, Parsons, Anchor QEA, Montezuma Audubon Center, Onondaga Audubon Society, and Honeywell. To learn more about the Onondaga Lake Conservation Corps or to participate in future activities, please contact montezuma@audubon.org or call 315-365-3588. Schools, community groups, local organizations, and individuals are welcome. Like the Corps on Facebook or visit YouTube to learn more. For more information on the Onondaga Lake cleanup, please visit www.lakecleanup.com. For more photographs of the Onondaga Lake Conservation Corps, click here.